Oh man. Last night when I walked into our loft, there where no words to describe the balmy fishy smell that was lingering in the air…and then Mark…standing, staring at me wondering what I was going to say, pretty priceless :0) I was actually preparing myself for the worse when I was coming up the elevator because I had already detected a hint of fish in the garage (later I found out that Mark had taken out the trash a couple minutes prior). SO- we opened up the windows and headed for Marcela’s Creole Cookery on James between 1st & 2nd in Pioneer Square. It was actually our first time and I have to say that I have been thinking about their Famous New Orleans Barbecued Shrimp all day…it was awesome. I even got to have a Original Pat O’Briens Hurricane (and I drank Mark’s too)…delish and can’t wait to go back! Anyway, back to why the food of an angel blessed our home last night :0) When we got back, we desperately needed to rid of the stench and the only thing I could think of doing (after drinking two Hurricanes) was baking the last cake mix in the cupboard. 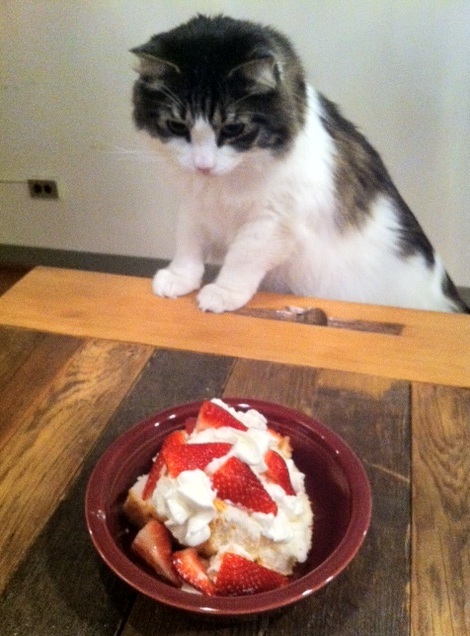 Just happened to be Betty Crocker’s Angel Food Cake…just add water, easy enough! I used two loaf pans and followed the directions on the box- pretty simple! About 20 minutes after I popped the pans in the oven, the house smelled wonderful again…mmmmm. Mark had purchased strawberries at Whole Foods a couple night prior so I cut them up. 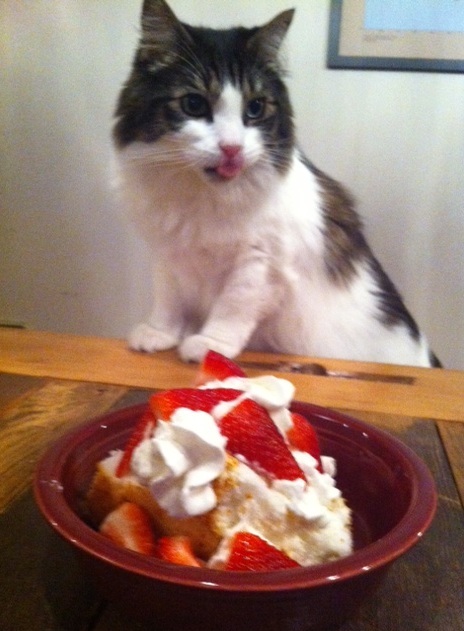 We also happened to have ReddiWhip in the fridge so I sliced the Angel Food, plated it and topped with whip-cream and strawberries. YUM! Angel food is a low fat and low cal treat too…but….the ReddiWhip, is everything but. As you can see, Jack was the official taste tester…sneaky guy! He loves his sweets!